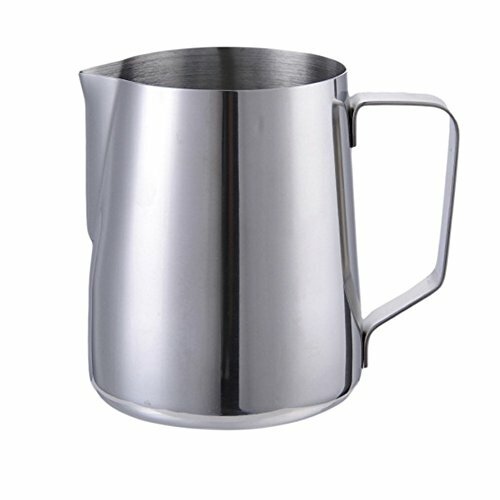 1.This stainless steel milk frothing pitcher can help you froth or steam milk for lattes,measure liquids,serve milk or cream. 2.With heat-resistant and carefully-polished handle,the frothing pitcher cup is much safer and more comfortable to use,Ideal to use with coffee machines. 3.Easy cleaning and Heat-resistant handle for safe,comfortable use,Easy to pour,Drip-less spout for precise pours and detailed latte art. 4.With this qualified milk frothing pitcher, you can enjoy perfectly steamed or frothed milk any time you want.Start your day with a matcha green tea latte. 5.With Sharp cup month for the stainless steel frothing pitcher,the milk or coffee will not stick on the cup when you froth or steam. And the curved design also let it to be a good decoration in your kitchen.